Amused by Jokers am I! : It's Just a Number! Does anyone really care about personal metrics? I suspect that nobody really cares about your weight or shoe size. I don't think anybody really cares about your IQ, SAT score, or your GPA. Or about your net worth or speed on the 100 yard dash. With that said, I'd like to share one of my numbers: 2,039. (as of June 22, 2017. Today, at the end of 2018, I'm 50% higher or more and in a growth phase. That's my number, two thousand thirty nine different jokers. 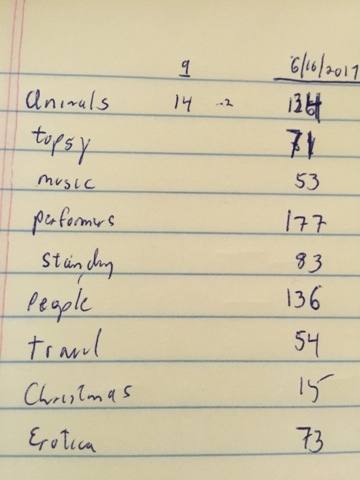 I just counted (June 22nd, 2017). Of course, I'll get more so my number is a moving target. A few weeks before, my number was smaller. In a few weeks more, it should be larger. 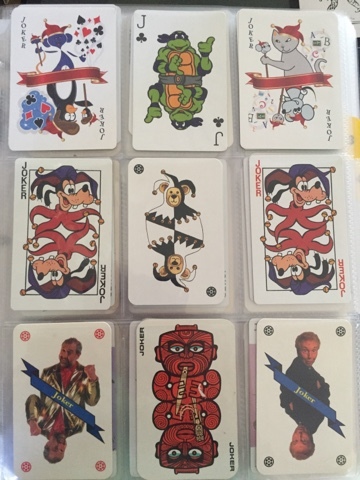 And sometimes, to my chagrin, I discover some duplicate jokers which means that I've counted one joker twice so then it goes down. 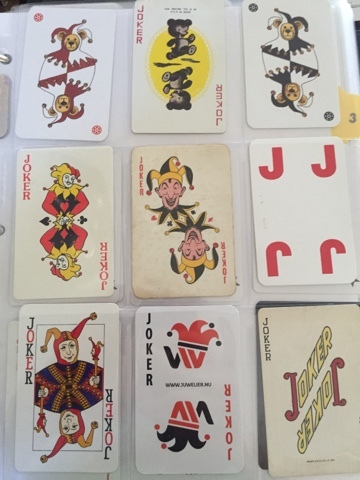 While there are many categories of jokers, my favorite are the topsy-turvy jokers. There are 71 of the topsy turvy jokers. (My least favorite are the clown jokers but that's a different article). 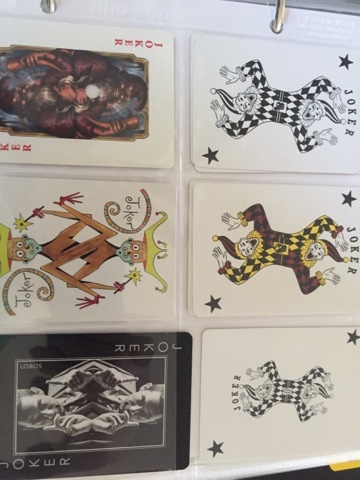 Topsy Turvy Jokers - There is no upside down! 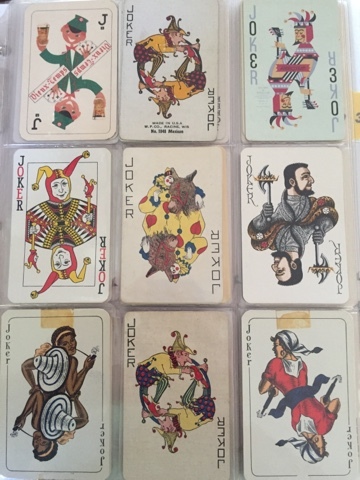 As I mentioned, the topsy turvy jokers are my favorites. 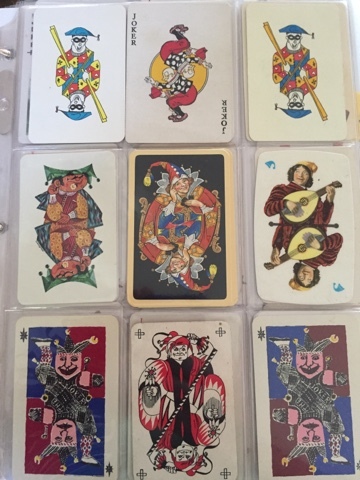 A topsy turvy jokers are those that are, like so many playing cards, symmetrical along the X axis. Or more simply, they are the same upside down as right side up. Or there is no way for them to be upside down. Here's 71 of them as they appear in my joker album. This next page is one of my favorite pages in the entire joker collection. Why? I like the topsy turvies generally and specifically, the ones on the top left and right were designed by me. Here's the story, I run a company in the educational technology industry and I have a small budget for SWAG. 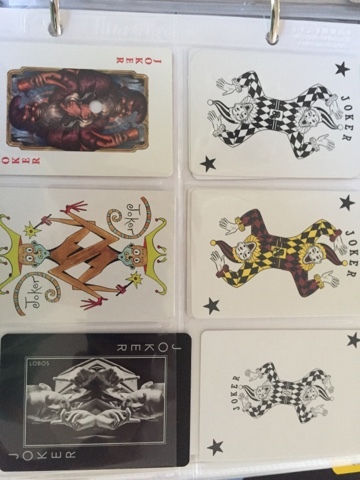 One year, I decided to create our own deck of jokers. The characters come from our products. So there is Ed Mouse, the Educational Mouse. There is also the Penguin from Word-O-Rama. 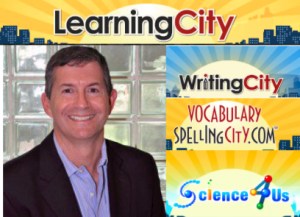 And lastly, there is the very famous cat and mouse from VocabularySpellingCity's Hangman game (actually, it's HangMouse). They also appear in Sound It Out. These last two pages are the pages that I haven't yet filled up with nine jokers. How did I count and how do I organize them? 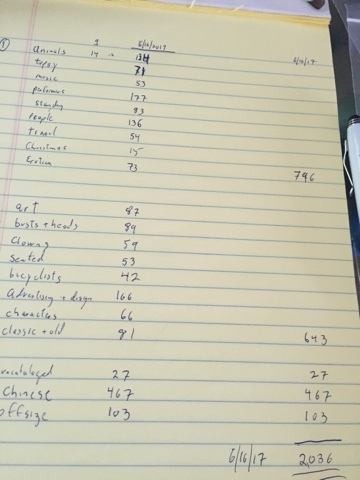 Since I have categories, I counted each of my 23 major categories. 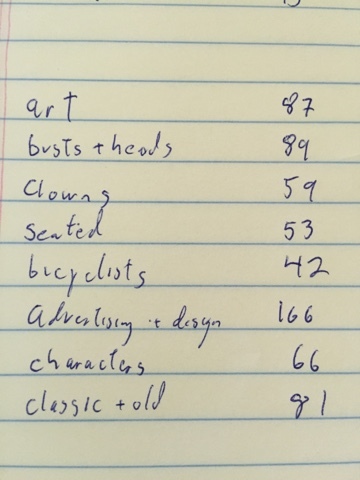 Here's the count of the first ten categories. 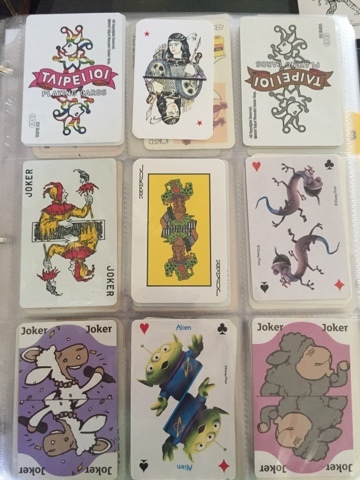 This says that in the first catalog, the first binder of jokers is animals and there are 134 different animal jokers. 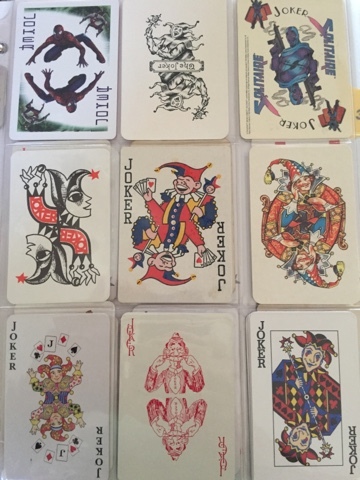 Here is the total count of the joker collections. It's maybe a little small to see. And that is the first public viewing of my joker organizational system. 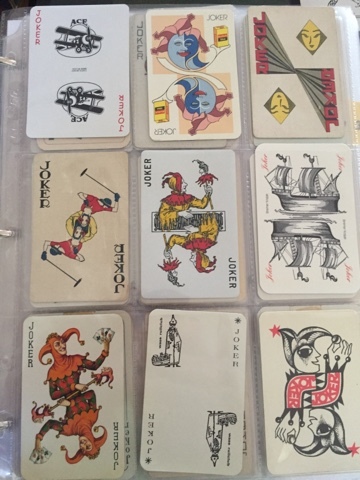 Looking forward, I am aware of some issues in this system of organizing playing card jokers and I'll surely be refining it. So much to look forward to it.